I only want part of a CD track--how can I record or edit that with RealPlayer? The easiest way to create a partial track is to record (or rip) the full track, then use the Trimmer to delete the portions you don't want. 2. In RealPlayer 18, right-click on the clip. Click Edit and select Trim. In RealPlayer 16, mouse over the clip's thumbnail image so that a menu appears. Click More and select Trim Audio. 3. In the Trimmer, click and drag the beginning and end brackets to the points where you want the edited version of the clip to start and end. 4. Click Save Trim. 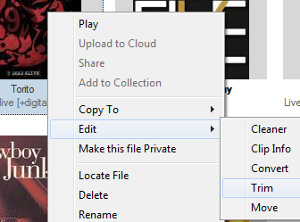 By default, this will save the new, trimmed file separately from the original file. Note: You can trim to a section of a item, but you cannot connect two separate sections.